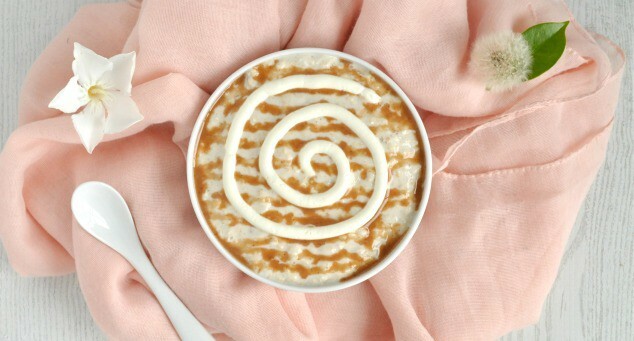 Healthy Cinnamon Roll Overnight Oats Recipe | Like a healthy Cinnabon! Perfect for those mornings when you want a rich and gooey cinnamon roll but you haven’t got time to run out to Cinnabon and you don’t want to eat your week’s worth of calories in one meal. This healthy cinnamon roll overnight oats recipe is easy to make, quick to prepare and tastes delicious. 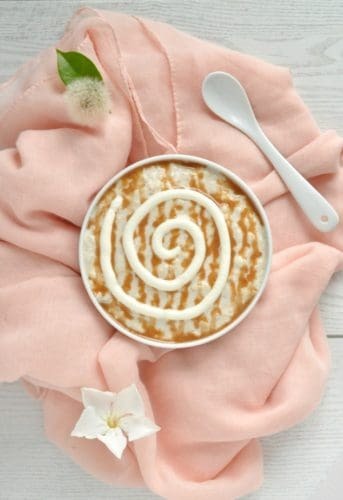 Seriously, if you close your eyes and eat a spoonful of soft, gooey oats sprinkled with sweet cinnamon, you’ll think you really are having breakfast at Cinnabon! We all need an army of quick and easy breakfast recipes we can call on for busy mornings, right? Well get ready to add this recipe to the top of your list! I love overnight oats because they’re so simple, versatile, fast and portable. Mix everything together the night before, scoop it all into a jar or container then take it with you to work or grab it from the fridge at home for breakfast. There’s absolutely no cooking, plating up or hassle involved. When you prepare your breakfast in advance when you’re not hungry, in a rush or stressed, you’re so much more likely to make healthy choices. And when you’ve got a fridge full of jars of overnight oats, why would you want anything else for breakfast? 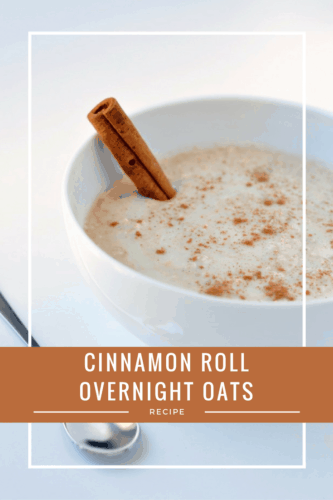 When I started developing these healthy cinnamon roll overnight outs, I was planning on making a bowl of ordinary oatmeal that tastes like a cinnamon roll. 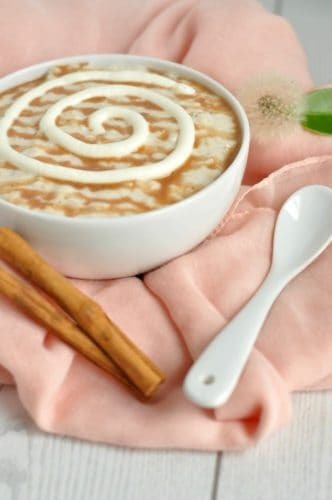 To see what other people were offering, I made up a bowl of cinnamon roll oatmeal from Mother Thyme. And you know what? It was way too sweet for me. Me. The girl who can happily eat a bowl of double chocolate cheesecake overnight oats for breakfast and then go hunting for a snack seconds later. It would have made a great dessert, but for breakfast? Not for me. I guess cutting down on sugar and calmed down my sweet tooth! So instead I went in a slightly different direction and made healthy cinnamon roll overnight oats instead. 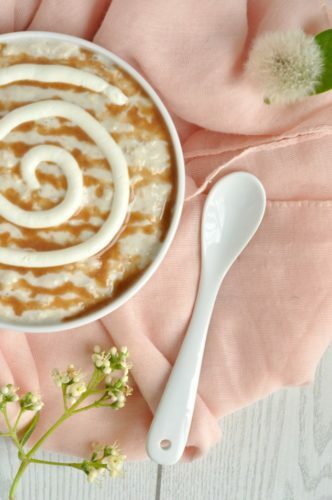 To get the recipe absolutely perfect, I ate these healthy cinnamon roll overnight oats for breakfast five days in a row! Even though each version tasted amazing, the final one was the one. The perfect amount of cinnamon swirl. The perfect amount of Greek yogurt and milk. And the perfect amount of cream cheese frosting on the top for a sweet Cinnabon twist. Perfect, perfect, perfect! If you love healthy overnight oats that taste like dessert, you’ve got to try these recipes, too! For the oats: in a medium bowl, stir together the oats, sugar, yogurt and milk. Scoop into a sealed container and leave to chill in the fridge for at least 4 hours. For the icing swirl: In a small bowl, stir together the cream cheese, vanilla extract and powdered sugar until smooth. Scoop into a piping bag (if you're feeling fancy) or place inside a sealed container and chill in the fridge. In the morning, make the cinnamon drizzle by stirring the cinnamon, brown sugar and water together in a tiny bowl. Cook in the microwave for 1 minute until the sugar has dissolved and a syrup forms. To assemble, scoop the oats into a serving bowl. 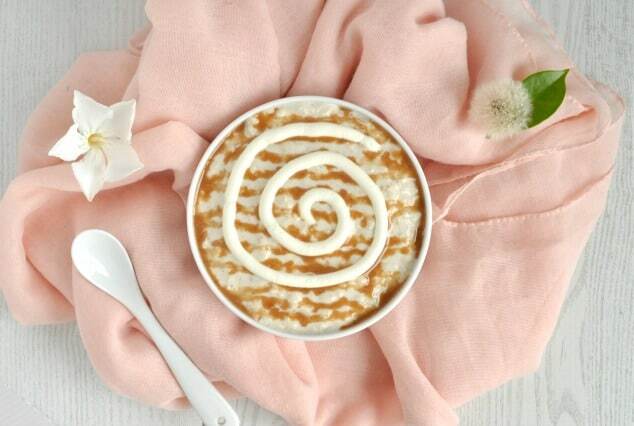 Drizzle over the cinnamon syrup and then pipe or spread on the cream cheese swirl. Sounds amazing and much better for you than cinnamon rolls. 😉 Easier too! I know, right, Lisa?! I’ve only made cinnamon rolls from scratch once before and it was so hard. This only takes a couple of minutes to throw together at night and then it’s ready in the morning! You’ve set up your site! A great flavor for overnight oats! Hope you are having a great weekend and thanks so much for sharing with Full Plate Thursday. Hi Alana! The yoghurt is used to create moisture for the oats to soak up and create a thick texture. You could replace the yoghurt with equal parts milk and add in a tablespoon of chia seeds to thicken it up. Alternatively, you could add an extra 3 tablespoons of milk instead of the 1/3 cup yoghurt. The oats will still thicken, but you won’t get the creamy texture you get by using yoghurt. Do you warm it up at all or eat it cold? What a fantastic way to get the flavour of a cinnamon roll in a wholesome, healthy breakfast! Love this recipe! I can’t wait to give it a try. Thanks so much, April! Sometimes a real cinnamon roll is just too much. This would be a perfect quick breakfast for my kids! Love it! Thanks so much, Lisa. Hope they enjoy it! I love the addition of yogurt, get some added protein in there! Yum! I love overnight oats – what a great way to dress them up for a sweet treat! I love them, too, Julie! And you’re right – you could even halve the ingredients and make a small portion for a lighter dessert. I’ve been making these a lot with homemade applesauce and maple syrup or honey! Thanks. I’ve never tried overnight oats with applesauce before! Gotta give that a try. Is this recipe low fodmap? Hi Caitlin! This recipe is low FODMAP if you use Greek yoghurt (it’s low in lactose so okay for people with IBS), non-dairy milk (my favourite is almond milk) and lactose-free cream cheese. I’ve been trying to get my family to eat oatmeal more and this may do the trick. Thanks for the great recipe!